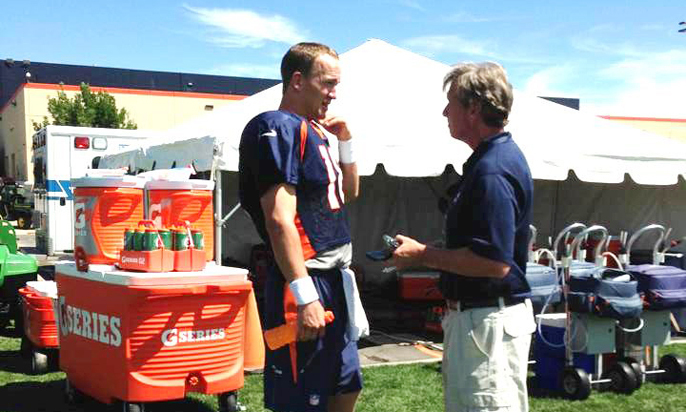 Covering the NFL for the L.A. Times has placed La Cañada High School graduate Sam Farmer in some pretty heady company, whether sitting on a discussion panel with former Dallas quarterback Troy Aikman (above), climbing a mountain with Commissioner Roger Goodell (below) or chatting up Denver quarterback Peyton Manning at practice (right). This was a call he had to take. It was former Los Angeles Rams running back Eric Dickerson, wanting to know what everyone else did: Were his Rams coming back to L.A.? “And I thought, ‘This is really a cool moment in my career,’” said Sam Farmer, a 1984 La Cañada High School graduate whose hard work covering the National Football League for the Los Angeles Times was recognized recently by the National Sportscasters and Sportswriters Association, which named him the California Sportswriter of the Year. This Super Bowl Sunday in Santa Clara, Farmer will lead the Times’ coverage of the showdown between the Denver Broncos and Carolina Panthers. Bet on him to enthusiastically, expertly find fresh angles at one of the planet’s most media-saturated events. Farmer has been finding new ways to get into the big game since he was a kid. As a high-schooler in 1983, he and three buddies posed as concession workers to slip into the Super Bowl (security wasn’t what it is today) and watch his beloved Washington Redskins defeat the Miami Dolphins, 27-17, at the Rose Bowl. Earlier this year, Farmer was at it again, getting inside the meeting at which NFL owners discussed whether to bring an NFL team — or teams — back to L.A.
Farmer wasn’t physically in the Westin ballroom where the owners were meeting in Houston, but he might as well have been: Hunkered down in his room at the same hotel, he was on the receiving end of texts from within, sources who updated him as votes happened, and on the movements of league Commissioner Roger Goodell. Farmer took to Twitter to feed the kernels of news to fans in real-time, his hungry legion of followers growing from 38,000 to 45,000 in a matter of hours. 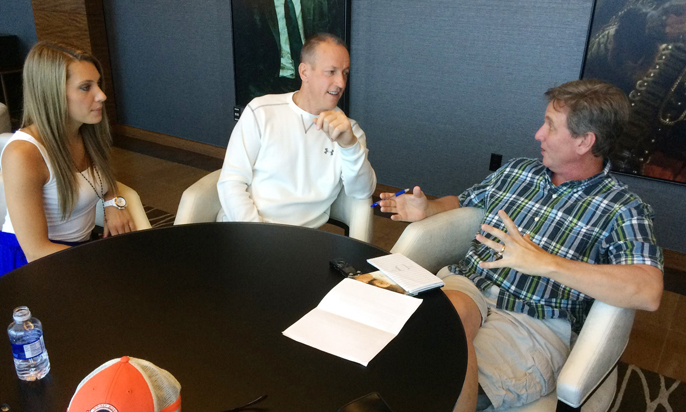 Former Buffalo Bills quarterback Jim Kelly and daughter Erin are interviewed by Sam Farmer. Farmer would have good news to give the Hall-of-Famer. By a 30-2 vote, NFL owners approved the Rams’ relocation from St. Louis back to Southern California, giving their blessing to plans that include a multibillion-dollar stadium on 60 acres in Inglewood that was purchased by Rams owner Stan Kroenke. It was to change the order of business at Goodell’s annual Super Bowl news conference. 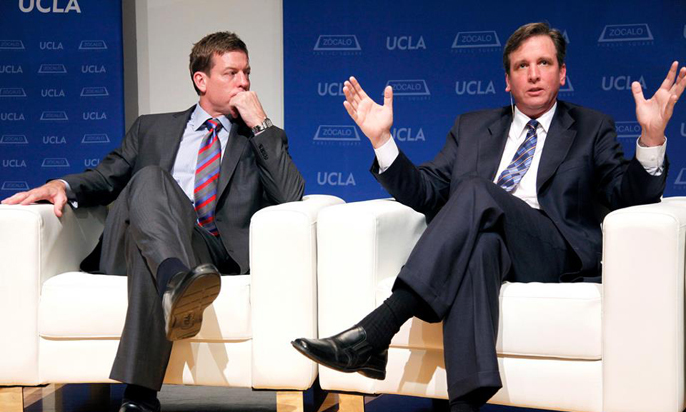 “In their first press conference here in L.A., [Rams’ COO Kevin Demoff] alluded to the fact that Sam would never have to stand up at the Super Bowl conference … and ask the question about, ‘When was football going to return to Los Angeles?’” said Gary Klein, the Times’ USC beat writer who once upon a time helped arrange for Farmer’s first freelance assignment at the paper, covering a high school girls’ basketball game. “That got quite a reaction [at the news conference],” Klein noted. Farmer remembers being a student at Occidental College and bracing for the reaction from Jerry Farmer, a physicist who worked for IBM and Xerox, when he learned his youngest son had changed his mind about his career plans. Farmer recognized that same automatic and absolute support from the NFL quarterback dads he’s reported on, men who are anything but the pushy stage parents one might expect. That piece is typical of Farmer’s atypical storytelling during the past 20 years as an NFL writer in a city with no NFL team. “It was a dream beat, the best NFL beat in the country, because I was not tethered to any team,” said Farmer, who took on the assignment, following stints at newspapers in Seattle and San Jose, the same year the NFL bid L.A. adieu. His editors asked him to take the “10,000-foot view” of the league, and Farmer ran with it. 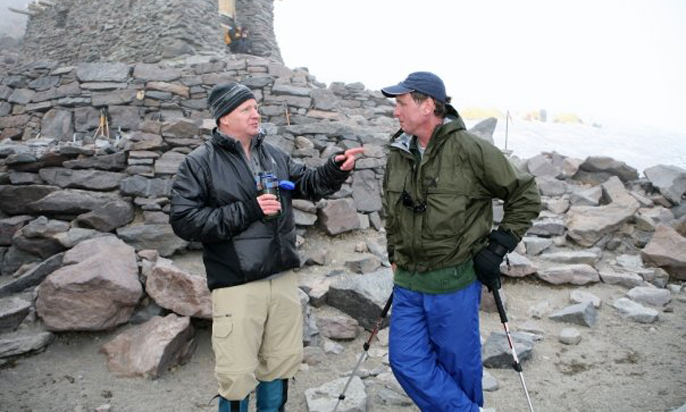 He hit the road with an officiating crew, managed to avoid stepping into the live picture while sitting in on a Monday Night Football broadcast and climbed Mount Rainier with Goodell. 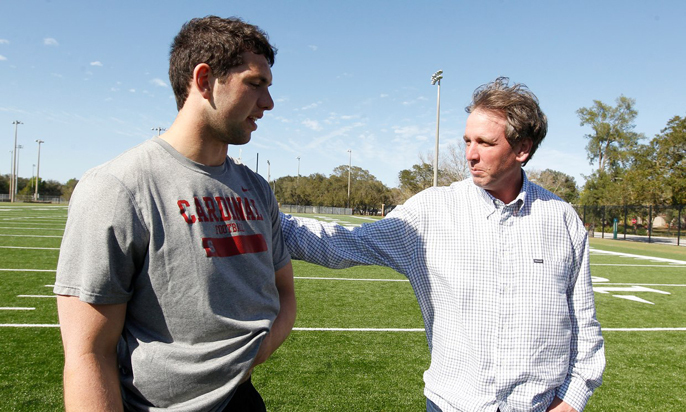 Sportswriter Sam Farmer (right) chats with Indianapolis Colts quarterback Andrew Luck. “He’s given people in Los Angeles the longer view, the 360-degree-from-above view, without really getting stuck in the minutiae,” said Klein, who first knew Farmer as the resourceful and sweet-toothed friend of his now-wife’s younger brother. That’s included introducing readers to Philadelphia Eagles long-snapper Jon Dorenbos, a capable magician who’s overcome a harrowing past. That’s one of Paige Farmer’s favorite stories told by her husband, she said, though she has many. “When we go and have dinner with people, I like to position myself across from him because I like to sit and watch and listen to the story and take it all in,” added Paige, a 1987 LCHS graduate. In another of those seminal moments, she spoke with Sam for the first time only when their paths happened to cross in Seattle, after both had left LCF. They now live nearby in the Sparr Heights neighborhood, where they’re raising children Thomas and Claire. And even with a team on his home turf, Farmer said he expects he’ll continue to be tasked with the long view, wherever that takes him and however he works his way in.